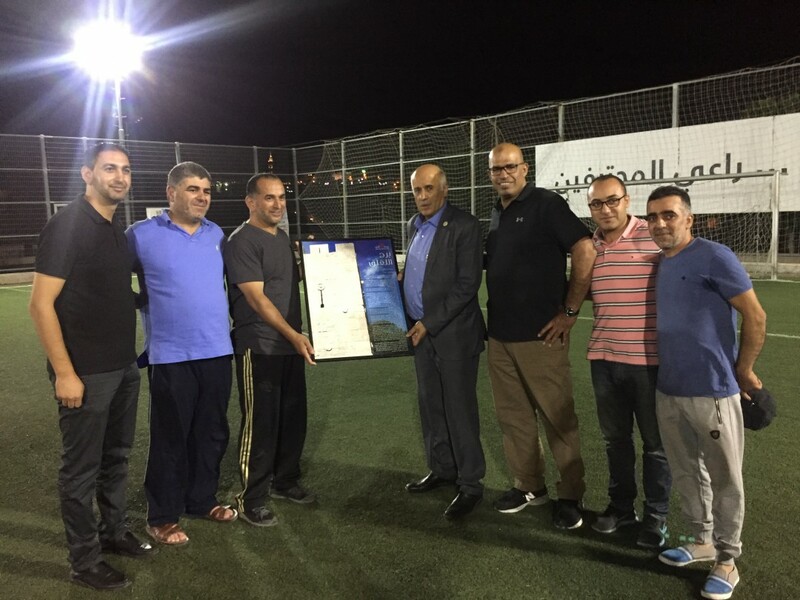 Burj Al-Luqluq Social Center Society Welcomed the Head Officer of Higher Council for Youth and Sports, Head manager of the Palestinian Olympic Committee and Palestinian Union for Football ‘ Jibreel Rjoub’ in a profile visit to Burj Al-luqluq and Its facilities. Head Officer of Burj Al-Luqluq Naser Ghaith, the Treasurer Imad Al-Shaloudi, Board of Directors Member Iyad Al-Za’tari, The Executive Manager Muntaser Idkaidek , The Athlete Abdul Qader Al-Khatib and Palestinian Academy for talented footballers Head Officer Firas Abu Mayaleh have welcomed and greeted Jibreel and thanked him for his visit. Mr. Rjoub recognized and looked over Al-Burj facilities, saw the grounds, Al-Amim land, the tent, the ceramic lab, the kindergarten, the historical Jerusalemite beacon, the garden and the main sport pitches. Then he looked over the administrative offices, Muntaser presented a brief description about Burj Al-luqluq work, goals, achievements and targeted groups through a video and a program which highlight in brief Burj Al-Luqluq activities and programs.